refers as a term of hierarchy, in groups of birds the highest ranked bird gets to peck the food first. not a reference to Popo's pecking order from TFS. Our group was getting tired tonight when we hit Freehold, so we didn't experiment much with this. Here's what we think may work, but haven't tried. 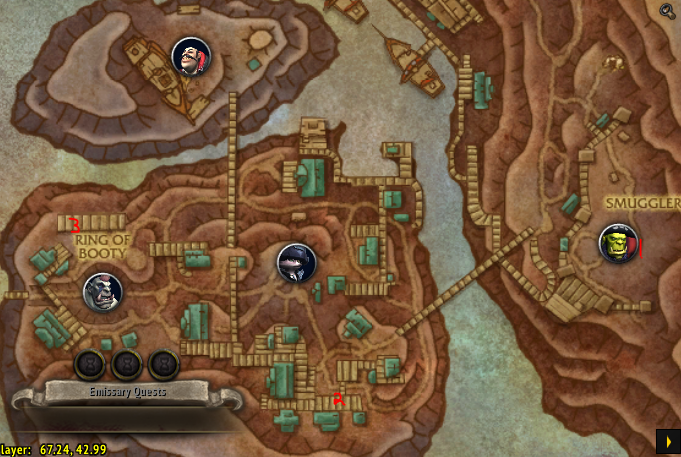 There are several references to Sharkbait's favourite food being crackers, and there's a item looted off various pirate mobs in Tiragarde Sound and Vol'dun called Salty Dog Crackers with flavour text that reads "A favorite of salty dogs and parrots." We suspect that it's as simple as killing the first boss, at which point Sharkbait briefly swoops down near the body and you offer him crackers, possibly by eating them near him. I should be clear this is purely a theory, though if the item I mention isn't a part of it I would be surprised. We'll be going back in on Tuesday for Mythic 0's and will be trying this then. If any information has popped up before then, or if we try and succeed/fail, I'll update this post with correct information. If anyone has ideas or suggestion feel free to post them and we'll try various things. If anyone else goes in before next Tuesday and can confirm/deny this method, we'd appreciate it. Final Edit: We have it figured out at last! The dish and the chow that we found earlier tonight are just 2/3 parts needed for the achieve, and credit to Philibuster for taking it home. After the first boss dies, a dish will spawn next to the nest called 'Sharkbait's Meal Dish'. Have one player click on this and it will despawn. There will be no indication that it's been looted, no buff or debuff and nothing in your bags. Then proceed across the bridge towards the rest of the dungeon. As soon as you get off the bridge, go left a short distance to the spiral staircase that ascends to the top platform. Near the top of these stairs there will be a bag of food propped up against the railing called 'Gourmet Parrot Chow'. Have the same player who picked up the bowl collect the chow, and they will again receive no indication that it's been looted. Then proceed to the wooden dock directly north of the third boss' room and you'll find a blue bowl. If you've collected the dish and the chow, you'll be allowed to click to 'Serve Sharkbait's Meal' at which point he'll fly down and you get your achievement. Here is a map showing the Dish (1), Chow (2) and Bowl (3). Here is a screenshot taken by one of the players that found the third portion of the achievement, who sent it to me to help everyone visualize it. 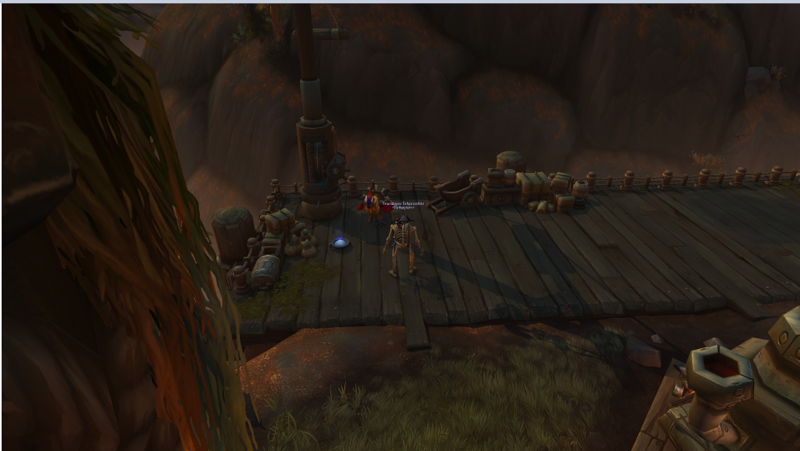 For this achievement you will have to pick up 3 items throughout the instance. Sharkbait's Empty Dish spawns in the nest at the first boss after you defeat it, Gourmet Parrot Chow is found on top of a platform in The Rum Quarter, and Serve Sharkbait's Meal is found near Sharkbait after the third boss. Here's a map with the locations. Dying after clicking any of the objects required for the achievement does NOT cause you to lose them. Thus, nearly any class can solo this achievement without worry of failing, so long as the dungeon has been cleared up to the third boss. 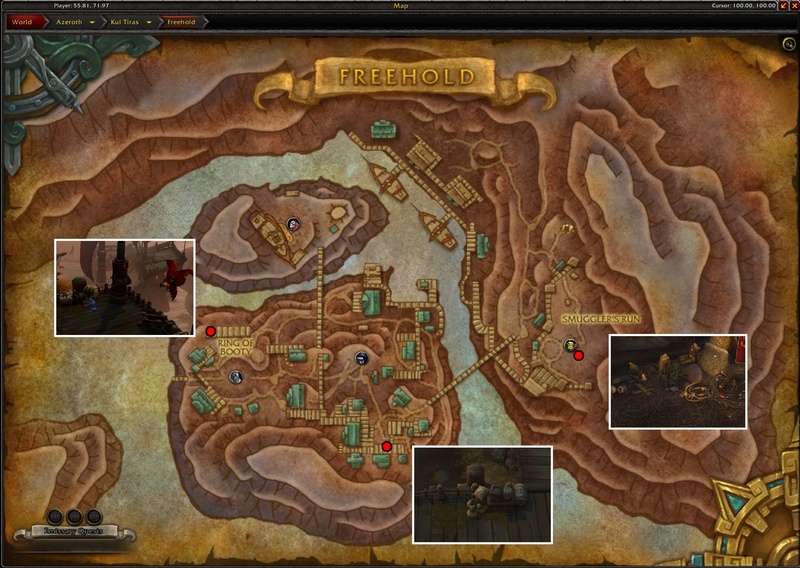 If you are locked to a Mythic Freehold for the week and have not yet completed this achievement, I highly recommend doing so, as it is hands down one of the easiest achievements to complete for Glory of the Wartorn Hero. Easy enough to collect them solo if you can't find a group willing to help with the achievements. At least as tank, likely as any stealth class as well. Still need to kill first boss though, but he's soloable as moderately-geared tank. It's possible to pull only a few packs of 2-3 mobs, and stuff up to first boss is better just skipped with invisibility potion. They're killable, but annoying and take too long to kill. I don't think this achievement can be obtained after you kill the last boss. I stayed after we finished and grabbed all the items in order but the bird and the last dish weren't there. It looks like you have to get it sometime after the third boss but before the last boss.